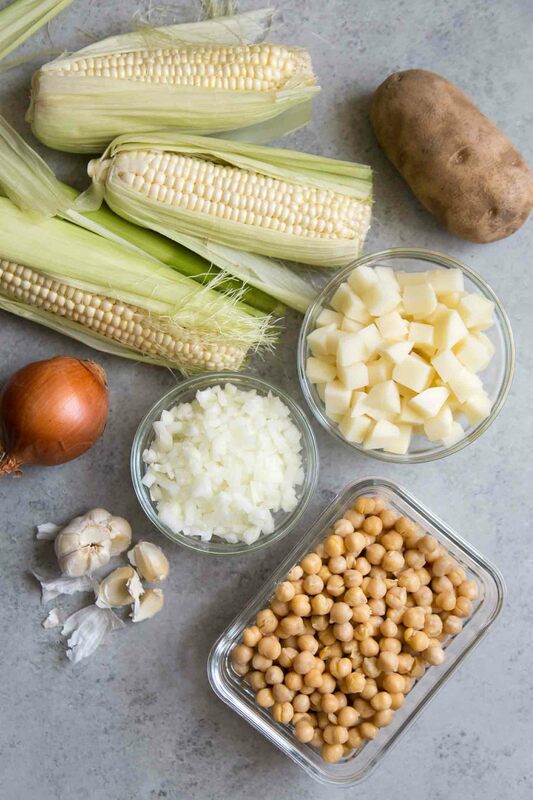 This chickpea corn chowder recipe is sponsored by USA Pulses & Pulse Canada. As always, all opinions mentioned here are entirely my own. 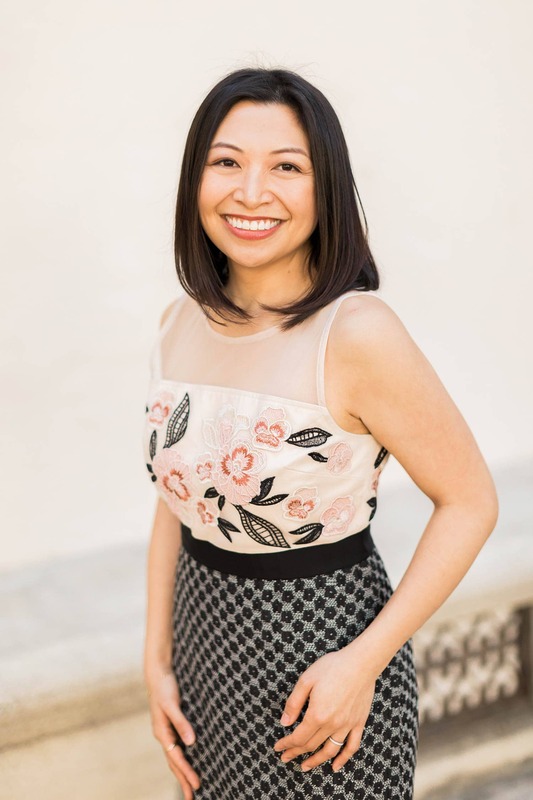 How do I maintain a healthy weight while eating all the cake, cookies, and ice cream? Life is all about balance. Believe it or not, when I’m not enjoying sweet treats, I eat a ton of vegetables. Give me salads, grain bowls, and roasted cruciferous veggies (broccoli, cauliflower, kale, bok choy). As much as I savor meats and fish, plants make up a much larger part of my diet. Today I’m sharing one of my favorite ways to introduce pulses in your weekly meal planning routine. Soup! It’s the easiest and quickest meal to make. Add everything into one pot and voilà! Pulses are the dry, edible seeds of plants in the legume family. While pulses are legumes (like soybeans, peanuts, fresh beans), pulses ONLY refer to the dried seeds. These include chickpeas, lentils, dry peas, and beans. Why should you care about pulses? 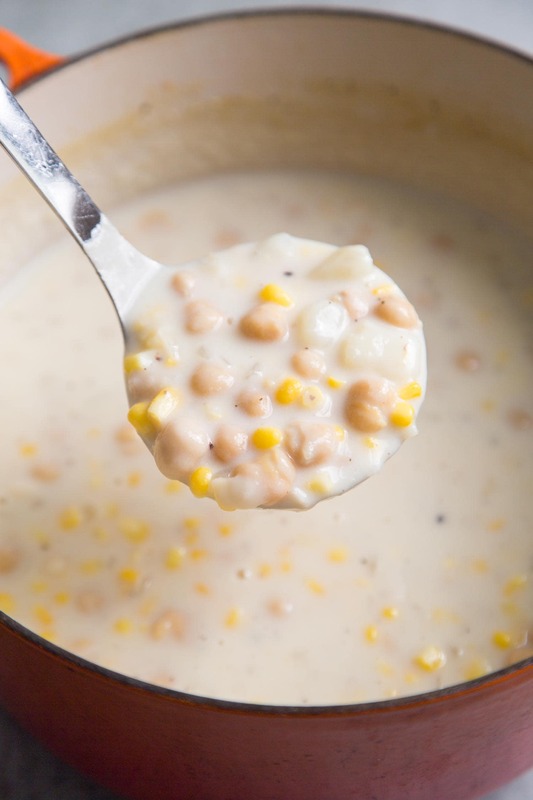 Corn chowder is a family favorite in my house. With a couple tweaks, I was able to amp up the nutrients without sacrificing on flavor. 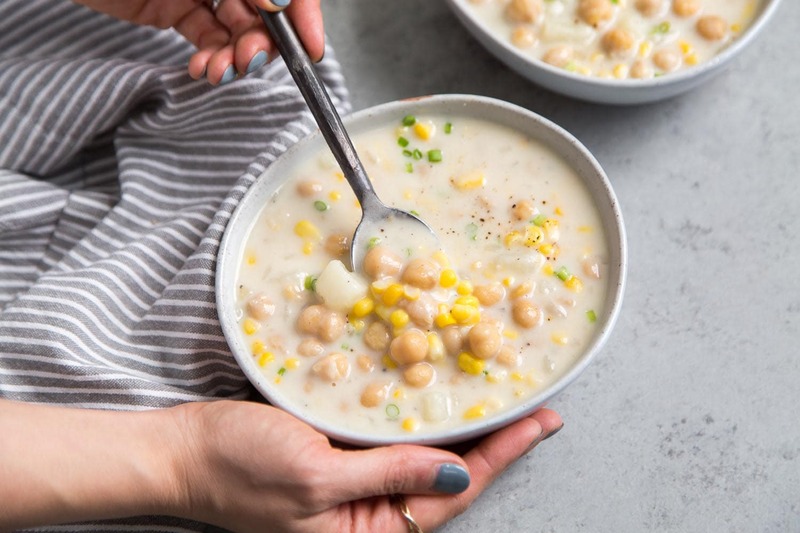 This chickpea corn chowder is the entire package. It’s not just a soup or starter to begin your meal. It is a meal in itself. 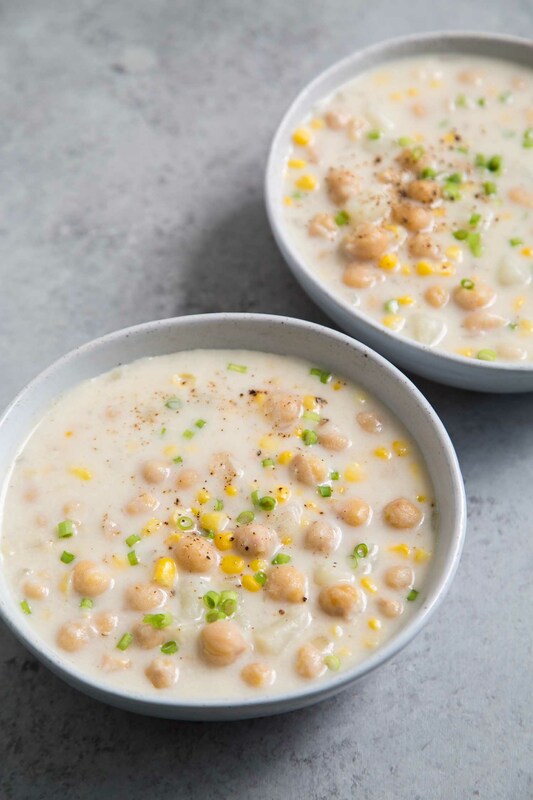 The addition of chickpeas packs this soup with protein and fiber, leaving you full and satisfied. The soup is simply seasoned with kitchen staples: garlic, onion, salt, and pepper. Instead of relying on heavy cream to thicken the soup, I pureed some starchy potatoes with the broth. It does the trick. But since this is a chowder, after all, I splashed in some half and half for that rich, creamy goodness. 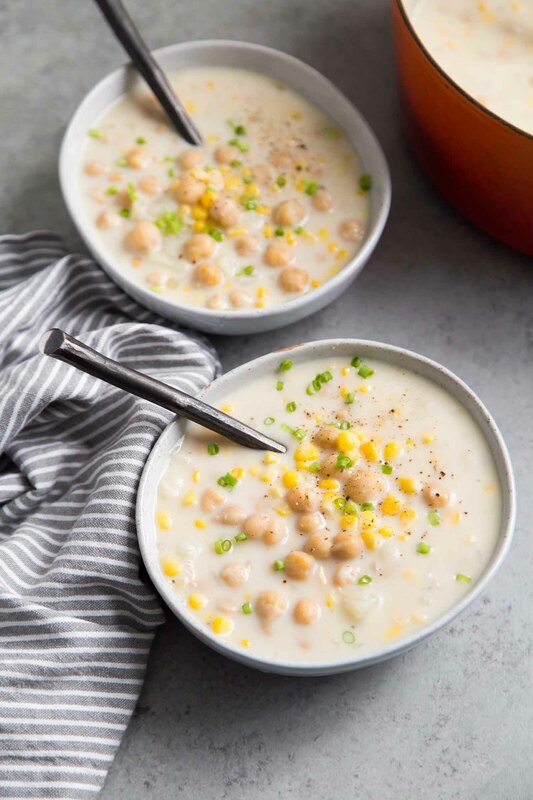 This chickpea corn chowder tastes even better the following day, once all the flavors have had time to meld together. I suggest making a large batch because you’ll definitely want leftovers! In a couple weeks, I’ll be sharing another pulse based soup featuring red lentils! In a large pot, combine olive oil and butter over medium heat. Once butter has melted, add garlic and onion. Cook until onion is tender and almost translucent. Season with salt and pepper. Add potatoes and chicken broth. Bring mixture to a boil, reduce heat, cover pot, and let simmer for 10-15 minutes until potatoes are fork tender. Scoop out about 2 cups of mixture and puree in a blender until smooth. Return puree back into the pot. Add half and half, corn, and chickpeas. Return to to a boil and then reduce to a simmer. Cook on low heat for 5-10 minutes until chickpeas are warmed throughout. (If using frozen corn, heat until corn is cooked). Season with additional salt and pepper, as needed. Garnish with chopped green onions. Serve warm. Chicken broth adds much more flavor to this chowder. If you would like to use vegetable broth, use one that is not heavy on tomato flavor.